"Therefore do not think that we have installed a marble statue. The rascals will say 'They are heathens.' No. We are worshiping Krsna personally. Krsna personally, Krsna has kindly assumed this form just... Because we cannot see Krsna, the gigantic Krsna, or Krsna is everywhere... Atah sri-krsna-namadi na bhaved grahyam indriyaih [Cc. Madhya 17.136]. Our imperfect senses cannot see Krsna immediately. But Krsna is so kind, as we can see... We can see stone, we can see wood, we can see earth, we can see water, we can see color. Therefore, Krsna comes before us just quite suitable for our vision. But He's Krsna. So this Deity worship, those who are in charge of Deity worship, they never should think that here is a statue. No. Here is Krsna. The honor, the respect, the samra (indistinct), means with great honor... You must always think that here is Krsna personally. Don't think that it is statue. Krsna personally. So you should honor and think also and be cautious so that you may not commit offense. Krsna worship, if you neglect the process, then it will be offensive. There are sixty-four kinds of offenses. You have seen it in The Nectar of Devotion. So not very much... You should be very much clean, first thing is. Cleanliness is next to godliness. Very much clean, rise early in the morning, take your bath and perform mangala aratrika, then chant Hare Krsna mantra, then read scriptures. In this way remain twenty-four hours engaged in Krsna's service. This is the purpose of installing Deity. Not that after few days you think it is a burden. No, then it will be great offense. It is not burden. It is a great opportunity to serve Krsna. 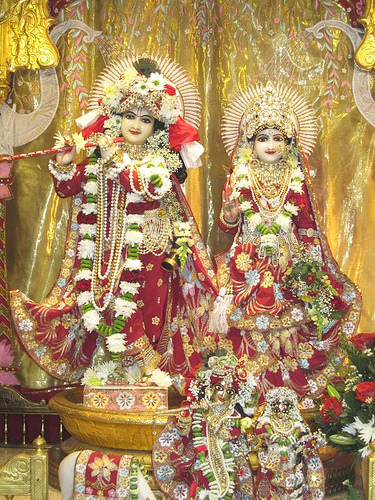 As the gopis are serving in Goloka Vrndavana. Krsna is so kind. He has come here to accept your service in a manner in which you can handle Him. You can dress Krsna, you can offer prasada, you can chant His glory. In this way, always remain engaged in Krsna consciousness and gradually you'll find how you are advancing in spiritual life. Thank you very much. Hare Krsna."